Amazon.com has promised to make a paid app free every day in the Amazon Appstore, and today's app is Dragon Fire. You've studied old legends and chemistry, mastered craft and magic, and built your own Dragon Fire machine. Now for the real challenge: it's up to you to catch the elusive dragon's breath. Test your skills--and your mettle--in Dragon Fire, an engrossing Android game that combines puzzler strategy with unique traffic-control gameplay. Can you solve the ancient puzzles in time? Can you redirect the deadly fireballs quickly enough to avert disaster? 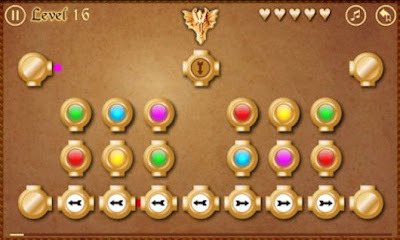 Find out as you embark on 26 levels that range from easy to incredibly challenging. As colored fireballs steadily emerge from the dragon's mouth, you must direct them to similarly-colored firecatchers. But the necessary pathways get more and more complicated as you advance through the game, eventually turning simple, logical pathways into complex patterns. You'll need to think fast in this test of mental acuity and reflexes. You can also choose your own path as you play. All 26 levels are open from the start, so if you're feeling daring, you can jump right to the last one. Try playing a regular game, in which you must catch a certain number of fireballs before time runs out. Or choose Survival Mode, in which you play for as long as you can keep up with the increasing pace of the challenges. No matter what mode you play, you can adjust the speed as you go. Play it slowly for a leisurely, Zen-like experience, or play it fast and prove that you're a true master.